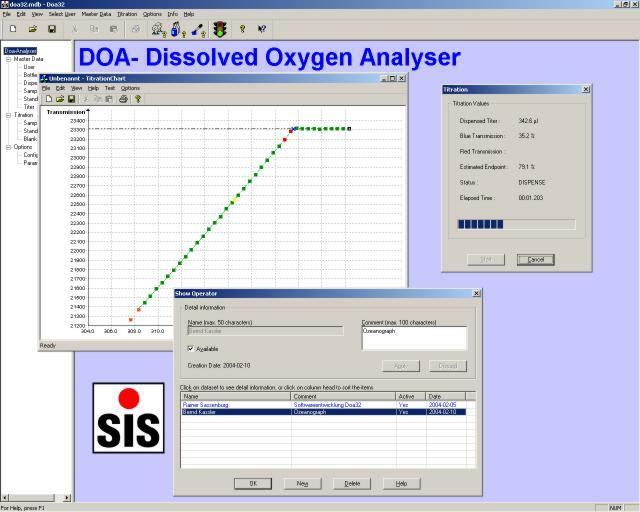 A new Microsoft® Windows™-based Software for SIS Dissolved Oxygen Analyser (DOA) supports the exact determination of dissolved oxygen content in in aqueous solutions according to the method developed by L.W. Winkler in 1888. This version replaces the old DOS based versions without changing the underlying physical and chemical measurement principles. The new version requires Microsoft® Windows™ 98, ME, 2000, or XP. The user who prefers the previous solution can still have the MS-DOS® based software.